Fruits and vegetables with a lot of fiber. Did you know that fiber helps to clean teeth and gums? Fiber helps produce saliva which is useful for cavity prevention and gum disease. Sugar and starches tend to dry the mouth, taking away vital fluid. 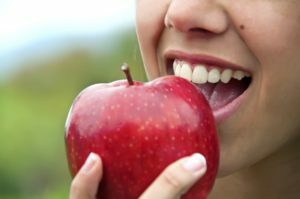 Saliva is essential to oral health due to the enrichment of calcium and phosphate needed to attack enzymes and bacteria. Dairy Products. Dairy also induces saliva. Products such as milk, cheese, and yogurt as also fused with calcium and phosphate. Dairy products help to rebuild your enamel and restore what other food may strip from your teeth. Tea, specifically green and black. Polyphenols, active in green and black tea, break down bacteria that causes plaque. These types of drinks also break down acids. Just make sure that your water is healthy as well because tea provides fluoride. Gum with no Sugar. Chewing gum cleans your teeth and creates saliva. This combination helps with the removal of bacteria particles. Foods with Fluoride. You can find fluoride in most poultry and some drinking water. Powered juices even contain fluoride. Just make sure there isn’t a high level of sugar. Candy. It’s impossible for some people never to eat candy. Not eating candy is indeed a difficult task but if you have a sweet tooth, go for candies made with refined sugar. Candy and sweets aren’t all bad. Dark chocolate has health benefits. Acidic Drinks. Sodas contain carbonation. Fruit juices contain acidic phosphorus. While these drinks are delicious, they wear away at enamel. Dehydrating substances. Alcoholic beverages are famous for drying out the mouth. Many medicines are strong enough to do the same. Make sure you ask your doctor or dentist about the makeup of the medicines you take if you feel as though they are drying out your mouth. This entry was posted on Thursday, March 21st, 2019	at 2:30 pm	and is filed under Catonsville Family Dentist	. You can follow any responses to this entry through the RSS 2.0	feed. Both comments and pings are currently closed.